The sound of music is everywhere in Salzburg and it is as powerful as it was when Mozart was still around or the von Trapp Family was performing – and you can be right in the centre of all the music and beauty Salzburg has to offer. 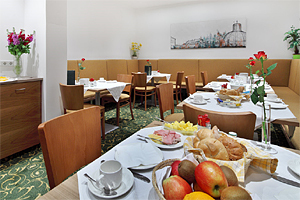 The Altstadthotel Weisse Taube is right in the heart of town, within a short walk of all the major sights. 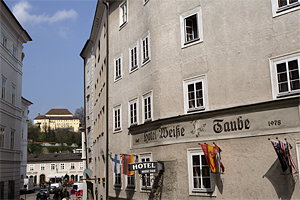 Altstadthotel Weisse Taube has been owned by the Wollner-Haubner Family since 1904 and is currently managed by the fifth generation, adhering to tradition as well as offering modern convenience to ensure you have a pleasant stay. The 30 individually sized single and double rooms are furbished in a very charming Austrian Style and the modern touches will ensure relaxation after a long day of sightseeing or an exhausting business day. Internet access is available in all rooms and in the lobby area. Are you being served? …. We offer a wide range of traditional breakfast dishes and to make your stay even more pleasant we serve it all fresh out of the kitchen to your table. Sit back, relax and start your day without having to get up all the time for a refill, a slice of bread or some eggs. 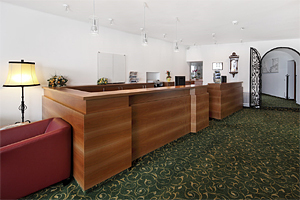 Our team at the Altstadthotel Weisse Taube is particularly knowledgeable of the town and the surrounding areas and will be able to help you with your desired activities during your stay. Only a 5 minutes walk away you will find Mozart's Birthplace, Mozart residence, access to the Fortress Hohensalzburg, the theatre district with the famous festival halls, the monastery of St. Peter, the big cathedral and the Residenz which used to be the home of the Duke-Arch Bishops of Salzburg and of course some of the locations where Julie Andrews filmed The Sound of Music over 40 years ago. We are happy to help you book concert tickets or tours in and around town, for which we can also arrange a pick up from the hotel. Tell us at the time of booking your room or arrange it all during your stay – however you prefer. By car: Please use "Kajetanerplatz" as the destination for navigation system. 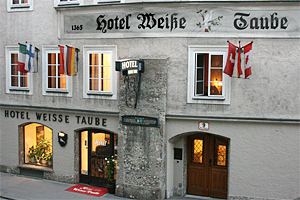 The Altstadthotel Weisse Taube is within the pedestrian area which is closed to public traffic by an automated bollard system. A few metres before the bollard there is a communications pillar which you can use to inform us of your arrival. You will then be provided with an entry code to allow access. Please wait until the bollard has fully sunk before entering the pedestrian zone. From the train station: Use any of the following busses: 3,5,6,25 and exit at bus stop "Mozartsteg" and turn right. Walk along the building, turn left at the corner and proceed all the way up (on your right you will see the statue of Mozart). At the top end of the building “Kaigasse” starts and the hotel is only another 50m away.